Ezee is a very unique product that contains natural plant extracts. 2 products in 1 jar that helps with everyday ailments. 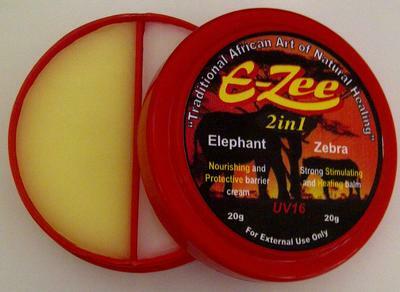 One half is a strong stimulating balm (Zebra) and the other side is a nourishing and protective barrier cream (Elephant). There are 50 million people in South Africa and each person and each household has some kind of ointment and/or barrier cream. ◦Every household buys this tipe of product and when it is finished they will replace it, making it a continuous sale. Become the supplier for EZee in your area. This product ideally suitable to stock at garages, spaza shops, informal traders, corner cafe's etc.